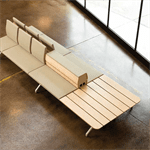 Zoeftig has recently extended its product portfolio with the introduction of the Landscape seating solution, an innovative bench-style modular seat that can be adapted to meet the specifications of any space. The new addition is the result of a three-way collaboration with Barcelona-based Batlle i Roig Arguitectes and its design partner, Emiliana Design Studio. Utilising Zoeftig’s unmatched expertise in the aviation seating industry, the three companies worked together to create a highly individualistic solution that could meet the requirements of any airport waiting area. The outcome was Landscape, a unique bench that can be adapted again and again. Its versatility can be put down to its structure: double aluminium profiles fixed to ground supports, which can be tailored to multiple configurations and carry any number of accessories. 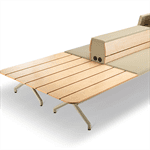 While some waiting areas may only require simple linear bench-style seating, others may seek backrests, armrests or tables. Landscape can deliver on all fronts, and it doesn’t stop there. Information panels, signage, bins and planters can all be added at a customer’s request, to create a waiting room experience like no other. With nearly half a century of expertise behind it, Zoeftig’s long heritage in creating world-class seating solutions is matched only by its commitment to innovation and modernity. The needs of today’s traveller remain at the forefront of every design process, and Landscape is no different. In whichever configuration, USB charging ports can always be added to ensure the modern traveller is catered for. Landscape’s modernity is also reflected in its appearance, which utilises clean lines and edges. Aesthetic is never compromised with Zoeftig, and interchangeable upholstery covers can be specially provided to ensure Landscape meets the visual requirements of its surroundings. Paul Williams, CEO of Zoeftig Group, said: “The whole design process of Landscape was carried out with versatility and, of course, quality in mind. The outcome was a durable, distinctive and flexible solution that appeals to architects and passengers alike, adding a touch of exclusivity to waiting areas worldwide.